Home Work Jagoffs Guess Where The Driving TEXTERS Went….. So we’re in downtown Pittsburgh doing a meet-up for some Ya Jagoff! paraphernalia. We pull into the drive way of the Marriott City Center, near the remnants of the ol’ Civic Arena. As we pull in, there’s this guy (pictured above) walking in the sunshine, reading his smart phone, sauntering….with no regard to the rest of the world… right down the middle of the hotel driveway. So we have time, and we pull out the iPhone and realize we are about to capture a Jagoff IN ACTION and it will indeed be the bestest ever Jagoff post on this blog to this point! We slowly drive behind this guy as he continues to walk while looking down at his smart phone. We’re driving behind him considering beeping to get a reaction out of him. But we don’t we wanted to see, ON VIDEO, how long it would take for him to realize there was a 2,500lb vehicle lurking dangerously behind him. Finally, the guy looks up. Looks at our car then looks right back down at his phone and KEEPS WALKING! Never an “I’m sorry!” nor one of those blank “I don’t know any better I’m from Cleveland” looks…. NOTHING!!!! Soooooooooooooooooooo we say to ourselves, this is classic!! Can’t wait to get back to the WJGF news desk and get this edited. If you think YOU’RE feeling disappointment, imagine DEVASTATION for us!!! We thought this was our breakout moment. Well, through the help of technology, we did spare the first .05 seconds of the video and got the above still photo. Yes, it looks a little suspect like most Sasquatch photos, but we swear, it’s him. And we might even go back to make a plaster casting of his foot tomorrow morning at the same time just to prove it! 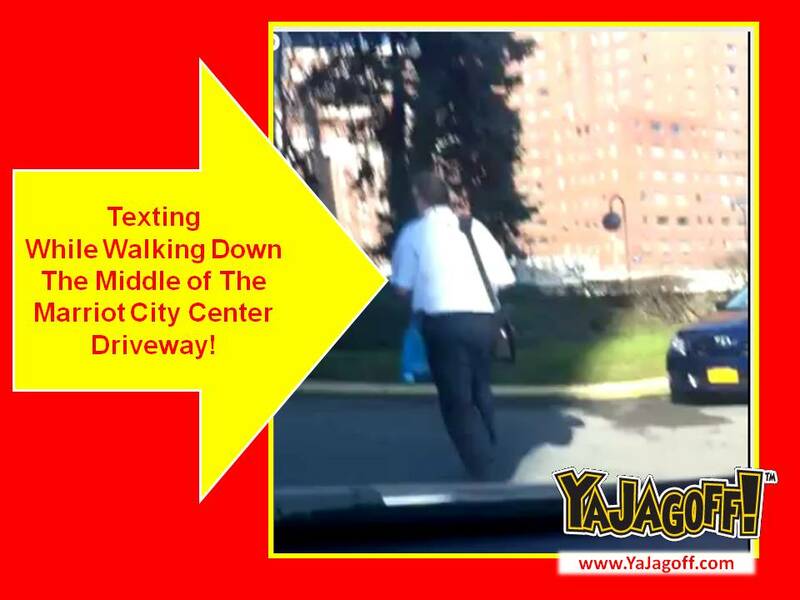 So back to may man texting while walking….. we have to admit, we have done this, more than once, and even did it after smashing our shins into a fire hydrant by not watching where we were walking. But.. and this is indeed the difference between a Jagoff and a non Jagoff, we APOLOGIZED to the driver or other walkers! Not THIS guy! So Mr. Mobile, it’s clear that, due to the new Pennsylvania “no texting while driving” law, that you do not have time to read your stuff on the drive in to work in the morning. But how about a little common courtesy and common sense ? Go grab a Primanti’s Sandwich and take the load off and read your emails while relaxing with the pigeons sitting on a bench in Market Square! Either that, or just get into work earlier and read them at your desk. But either way, don’t text and walk in the street, Ya Jagoff! Click on the photo below to see all of ‘em! Next articleI’m A Little Confused On Where The Carts Go!